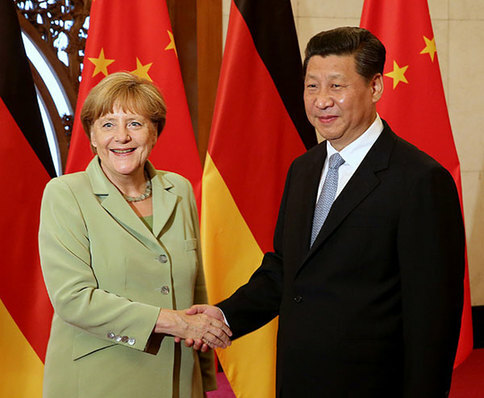 Germany, “Up in Arms” against Washington’s Sanctions Regime, Is Madame Merkel Up for a Ruse? Everybody with a clear mind is up in arms about the US Congress’ latest sanctions against Russia – and as usual – sanctions for naught- zilch, zero – since Russia hasn’t done any of the things Washington and the servile west accuses her of, like interference in US elections (US secret services have repeatedly said there is no evidence whatsoever), interference in Ukraine (Washington / NATO / EU have instigated and paid for the bloody Maidan coup in February 2014); annexing Crimea (an overwhelming (97%) vote by the people of Crimea for reincorporation into the Russian Federation – their given right, according to the UN Charter). Even if Russia wanted to, she couldn’t correct any of her ‘mistakes’. They are all invented. None of the accusations have any substance. But the western presstitute keeps hammering them into the dimwitted brains of the populace. We can only repeat with Joseph Goebbels, Hitler’s Propaganda Minister: “Let me control the media, and I will turn any Nation into a herd of Pigs”. Well, the western Anglo-Zionist propaganda machine has successfully turned western civilizations (sic) into a herd of pigs. Is every member of the US Congress really that stupid to believe, for example, in Russian interference in US presidential elections? – Or do they simply believe “We, the US of A and Masters of the Universe, do it all the time, so Russia must be doing it too”? Although President Trump appears to utterly dislike that the Senate – his Senate – has followed the direction of the House and overwhelmingly approved the new ‘sanctions’ – El Donald has eventually signed them after all. Was his dislike just another scam? Madame Merkel too appears to be ‘up-in-arms’ about the new set of sanctions – which by the way won’t do anything to Russia. Russia is way beyond being affected by economic sanctions, as her economy is largely detached from that of the west. Russia as well as China, and the entire Shanghai Cooperation Organization (SCO) have learned fast. President Putin, while making a straight face in view of more stupid sanctions, must be chuckling about western ignorance still believing in the Master of the Universe’s right in handing out punishments to his ‘underlings’ when they don’t behave – even when chastising is based on total lies. In fact, these anti-Russia sanctions would penalize Europe for being stupid vassals. Hilariously, they would, for example, fine European companies participating in joint Russian-European pipeline projects. So, why do the ‘sanctions’ continue? – Propaganda, stupid! – The rest of the world must believe America is the greatest, most powerful and can police the world at their whim. That’s Washington’s ultimate tool for survival – a web of lies clad in massive propaganda – exactly following the edict of Goebbels. Which brings our western system to the point – total lawlessness, no morals no ethics – an everything-goes neoliberalism, turned neo-fascism. Make no mistake – open your eyes – in case you haven’t noticed, that is what we are living today. Destruction of ancient civilizations; Greece, as well as the cradle of today’s western culture mercilessly devastated; Syria, Iraq and almost the entire Middle East and North Africa up in flames – and nobody says peep. It’s become the new normal. The sick western society just gulps beer and watches football. A full-blown, careless, selfish ‘redneckization’ of the West. But Madame Merkel doesn’t belong into the category of ‘stupid’ – she just wants by all means to be elected. Or better said, she is ordered to be re-elected for the 4th time on 24 September 2017 by the Deep Dark State. Therefore, she has to do what makes her popular at home, even to the seeming detriment of her relationship with Washington. Trump, by the way, too, is just a minion of the Deep Dark State and has to do their bidding. He knows it, she knows it. A little make-believe spat between the two doesn’t matter. 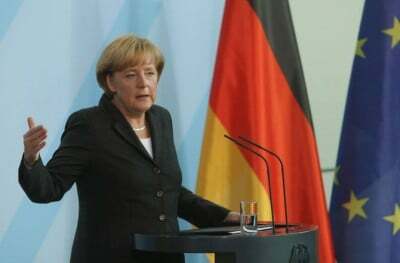 It’s just a game to further dupe the populace into confusion and into believing that finally Europe may become a sovereign continent again, thanks to the apparent leadership of Madame Merkel, turning away from the Atlantists, taking back responsibility and sovereignty. Of course, not to forget her to siblings in crime, the other two “Ms” – Macron and May – will follow her lead. Therefore, every lil’ thing is gonna be alright. Madame Merkel has joined the chorus of those condemning the ‘sanctions’ – saying enough is enough. Same tone she used at the recent G20 Summit in Hamburg – ‘we have to take responsibilities in our own hands’ – basically admitting that she and the other EU vassals had left the responsibility in the bloody claws of Washington. 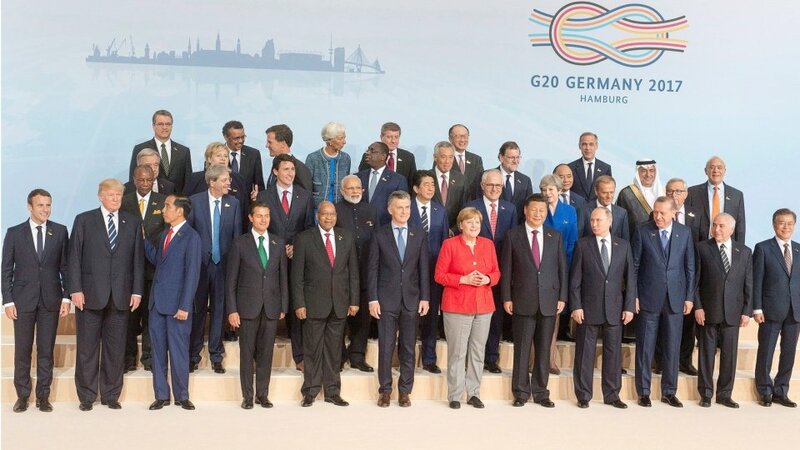 The entire Hamburg G20 Conference was an orchestrated farce, a trial run for worse, much worse to come. It was a training ground for police and bought violent protesters. It’s part of urban warfare drill – as is more quietly being prepared in Saxony-Althaus, where the Bundeswehr and NATO are building an entire ghost town in one of Europe’s most modern army camps to train military and police for repressing people’s resistance against coming neofascist tyranny and austerity. These are the signs for what’s to come in the near future, as the Deep Dark State thinks it’s close to the NWO – Full Spectrum Dominance. Wake up, people. It’s never too late – before they militarize every street of your town and strip you of what’s left of the meager remnants of your civil rights. Martial Law will soon be inscribed in EU members Constitutions, beginning with France. That’s certainly in the plan and in the cards. The three “Ms” (Merkel, Macron, May) are cooperating hard to make it happen. And if the three Big Ones do it, the NWO clan believes the other EU vassals will follow in lockstep. And they may – as the criminal propaganda machine is sending deadly salvoes of lies into the western public. Madame Merkel’s ‘taking back responsibilities’ and her outcry against new US sanctions for Russia should make her popular again – should make her electable – again, in less than two months-time. This is what the German people want, the vast majority of them anyway, an independent and sovereign Germany and Europe, one without the Brussels-NATO-Washington dictatorship. People and even more so businesses, are sick and tired of the anti-Russia discourse. They want peace and normal relations with Russia; natural relations of neighbors, as they have been existing for centuries before the new Anglo-empire across the Atlantic came to the fore. Mind you, the new Anglo-empire is made up from European defectors – and ruthless warriors, who felt much safer between two shiny seas, than tethering close to the conflict-ridden old despotic continent. In the meantime, the new empire has been infested by the Deep Dark invisible state. Back to Madame Merkel. What if her grievance with the latest sanctions is just a ruse, a manipulation of public opinion to be reelected? And when she is reelected, will she turn her back again on Putin and shake hands with Trump? All is possible. It’s a blueprint of typical neoliberal chaos and confusion. Put people in delirium and you can do whatever you want with them. One thing is for sure – the big nasty bulldog won’t let go until he has achieved its objective, in this case, the PNAC objective – Full Spectrum Dominance. This means subjugating Russia and China, an alliance made of steel. However, against this alliance of steel, the bulldog may succumb for lack of oxygen and faltering energy. This new alliance, also called SCO, for Shanghai Cooperation Organization, is offering a new and real economic perspective, the New Silk Road, also called the One Road One Belt (OBOT), or One Belt Initiative. President Xi’s OBI is rapidly gaining new momentum and allies, more strength and more attraction for all those western nations which always wanted to defect from the nefarious western dictate, but were afraid to dare. And yes, it can’t be said often enough – the Future is in the East. The West is slowly but surely drowning itself in its blood-drenched violence and propaganda of lies. Madame Merkel, better take note of it.